It has been requested that we allow users to resize the preview window so that the preview can be made larger. How about more greater option for AJAX internal wikilinks window. 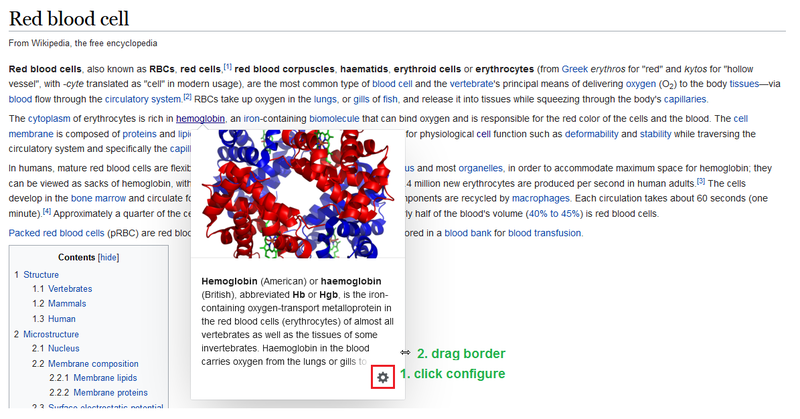 Also enable option with page previews in other namespaces, wikipedia rules pages, user pages etc. Making the preview size dynamic would likely requirement many adjustments throughout the codebase in particular the "pokey" pointer that points to the link and thumbnail both work on the assumption that the size is fixed. Given preview api endpoint is heavily cached supporting different thumbnail sizes is non-trivial. Hey there! I'm unfortunately not understanding the problem you are reporting here. Could you possibly add some screenshots and explain some more? Jdlrobson added a project: Readers-Web-Backlog (Design). Jdlrobson renamed this task from AJAX internal wikilinks (page previews) too small window and too tiny text to Allow users to resize page previews .